As I noted in an earlier post, we thoroughly enjoyed Different Lines: Drawings by Craft Artists at the Fuller Craft Museum in Brockton, Massachusetts, which explores the lesser-known creative abilities of artists known for their work in ceramics, glass, jewelry, wood or textiles. Lissa Hunter’s drawings were a surprise and a delight, Vivian Beer’s and Dan Dailey’s are an interesting variations on the works for which they are better known. We took several photos, but rather than play the spoiler, we thought we’d offer you some images of other artist drawings — you have until February 27, 2011 to see the Fuller exhibit for yourself. Our Stall, Tanforan, ca. 1942-1944 / Kay Sekimachi Stocksdale, artist. Drawing : 1 item : graphite ; 24 x 32 cm. Bob Stocksdale and Kay Sekimachi papers, 1937-2004. Archives of American Art. Kay Sekimachi studied drawing and painting at the Tanforan relocation center (for Persons of Japanese Ancestry) when she was a teenager in World War II. 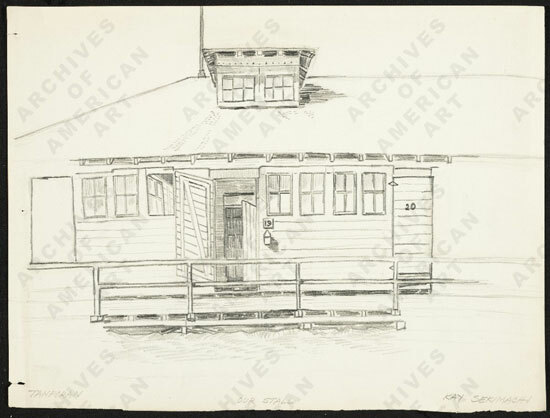 The Smithsonian Archives of Art include this drawing by Sekimachi of Tanforan. 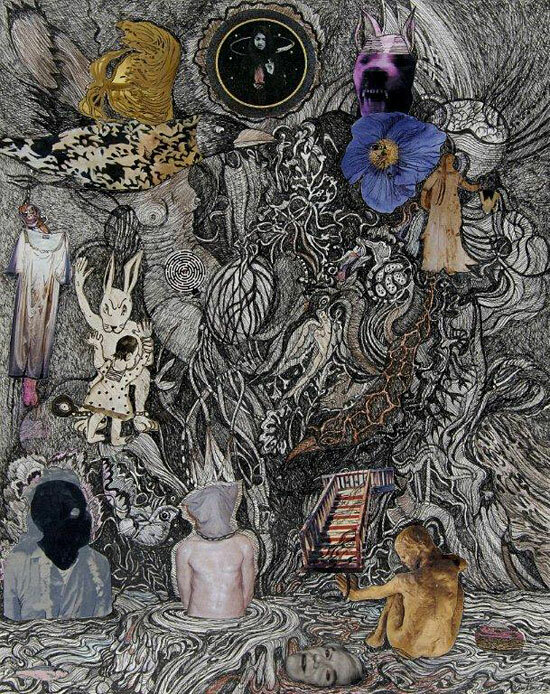 For Ed Rossbach, sketches sometimes presaged new work and other times were incorporated into collages or transferred onto directly onto baskets. 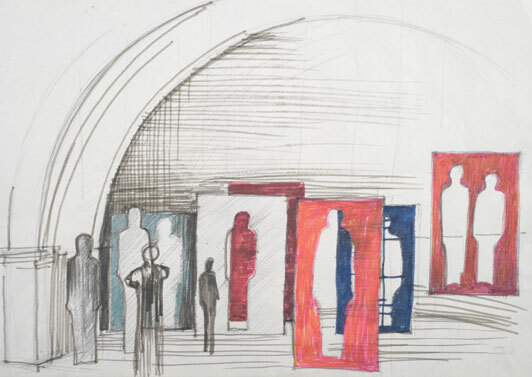 Here is Lilla Kulka’s sketch of her works as she envisions them hanging in space as a group installation. 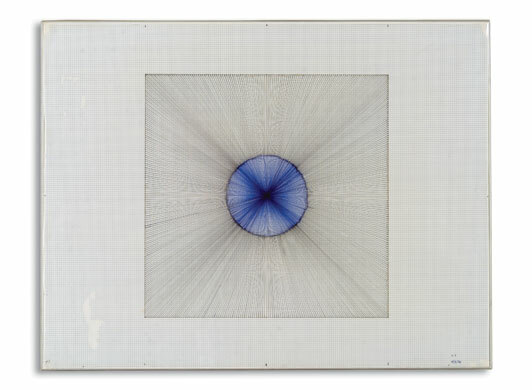 Lenore Tawney created geometric drawings in the 1960s, that preceded Sol LeWitt’s wall drawings. Years later, Tawney made three-dimensional sculptures of thread in plexiboxes based upon the “Drawings in Air” series. We finally made our first trek to the Fuller Craft Museum last weekend. 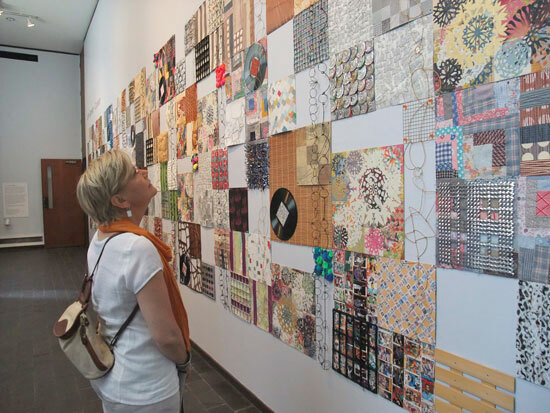 A chance to see The New Materiality: Digital Dialogues at the Boundaries of Contemporary Craft and Different Lines: Drawings by Craft Artists in a single visit was a part of the attraction. It was the break in the summer heat and a chance to drive up the coast, however, that made the trip irresistible. We grabbed our dog-eared copy of New England’s Favorite Seafood Shacks, by Elizabeth Bougerol and we were off. First stop, Harbourside Lobstermania in East Greenwich, Rhode Island for fried clams and a lobster club. Tom, the fried clam connoisseur, rated the fry batter appropriately light and rated the proportion of belly clams high. We left well fueled for more cultural pursuits. The Museum’s setting is tranquil, on 22 wooded acres on the edge of Upper Porter’s Pond. The galleries are housed in a large (21,000 square feet) attractive contemporary building. As you walk between the larger exhibition spaces, art can be seen indoors and out. More than 130 ceramic fish from Nancy Train Smith’s Migration populate the courtyard moat and the adjacent pond (through October 31st). John Garrett’s multilayered Caravan, fills a large wall in one passageway. Inspired by textiles created by the nomadic peoples of the Middle East and West Africa, the installation is made of everything from LPs and buttons to crushed aluminum cans and sports trading cards (through March 27, 2011). Mariko Kusumoto’s extraordinary metal sculptures, which feature myriad doors and drawers and moving parts, was visible from the Museum’s gift shop (Mariko Kusumoto: Unfolding Stories), but needed to be examined up close to truly be appreciated. And in another passageway, furniture from the permanent collection is displayed (through September 26th). Importantly, the contents of the main galleries did not disappoint. For glass fans, there’s a large grouping of Josh Simpson’s kaleidoscopic works (through November 28th) and the drawing exhibition offers interesting glimpses into several artists’ varied abilities (through February 27, 2011) (more on that in an upcoming post). The highlight, however, was The New Materiality, curated by Fo Wilson, which features 16 artists, “working within established craft disciplines or with traditional craft materials who are treading compelling territory between their mediums and emergent technologies” (through February 6, 2011). From Lia Cook, an early adopter of the digital Jacquard loom, there are digital portraits, though Wilson asks, if Cook is trying to take us somewhere beyond textile or portrait, somewhere “where the textile itself takes on an added subjectivity?” In Anxiety, Shaun Bullens uses a virtual parakeet in combination with two pieces of elegantly rendered furniture to address issues of freedom and personal space. By incorporating video of rolling tree trunks into a wooden table, in Table I: Murmur, E.G. Crichton and Susan Working ask viewers not to take for granted the living materials that become functional objects in our homes. 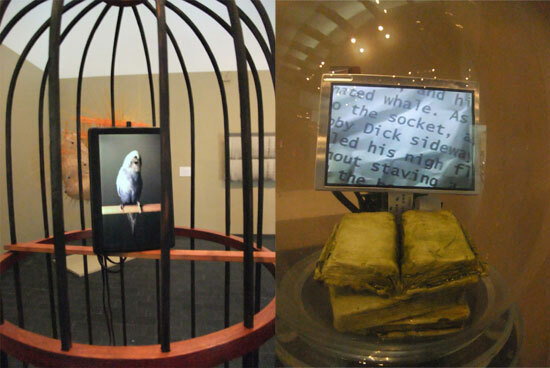 There is much more: Tim Tate’s reflection on the obsolescence of books and Brian Boldon’s glass works that confound the viewer’s perception and a smart catalog. The result is a thought-provoking grouping that avoids any sense of the gimmickry that sometimes accompanies works that claim to integrate technology but in fact include it as no more than embellishment. The Museum is 30 minutes out of Boston; 4.5 hours from New York and Newark; 3.5 hours from southern Connecticut. For us there was also a stop at Ward’s Berry Farm just up the road in Sharon, Massachusetts and, not to be missed, The Place, in Guilford, Connecticut for roasted clams, mussels and corn for dinner. All well worth the trip.